If you follow my blog you may have wondered, "What has HandyDan been up to lately?" The truth is I've been taking a little break from watch collecting and the few watches I have been working on have been repeats of other watches I've already showcased. So the few postings I've done lately are only "new" things I have to share. However, I have recently obtained a few more project watches that are models I haven't seen before so I'll have more to share with you later this month. 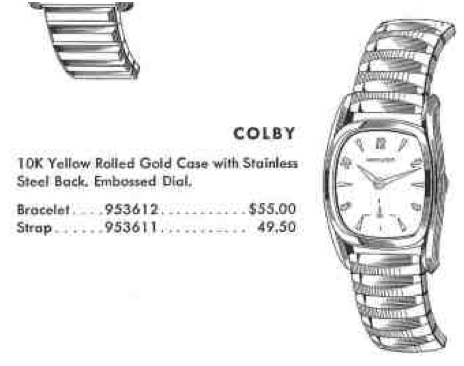 In 1956 Hamilton introduced the Colby B. You may recall from the Paxton that I posted last month that there was also a Paxton B. I posted a Cabot B in October. The Cabot, Colby and the Paxton are three of a few models where there was a B model in 1956 and a "regular" model in 1957. Oddly, the Colby B and Cabot B have Illinois movements while the Paxton B had a Swiss movement - it makes me wonder if maybe I have the Paxton models backwards but I'm pretty sure (based on my memory) that the Paxton B I had a few years ago had a round Swiss movement. 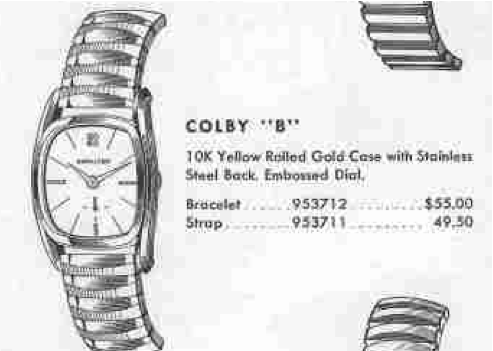 Anyway, unlike the Paxton and Cabot though, the Colby and Colby B have different dials - which is why I had a hard time identifying my Colby. The Colby comes with a 10K rolled gold plated bezel and a stainless steel back. 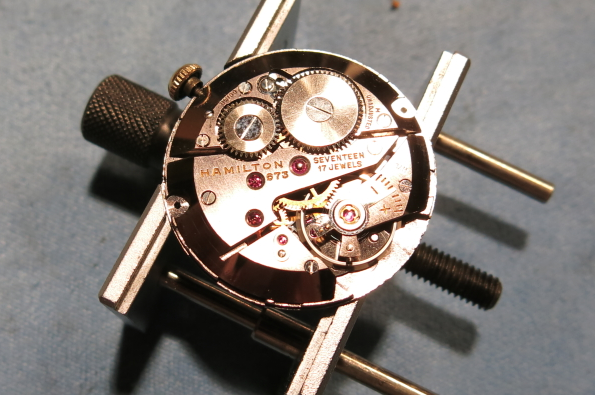 The Colby B has an Illinois movement while the Colby has a Hamilton 673 movement. The dial is butler finished with embossed gold-colored markers and numerals. My project Colby was very dirty when I purchased it at a local shop. 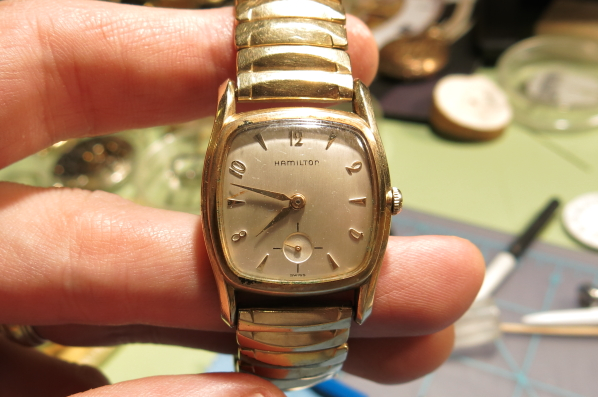 If you've got an eye for details you'll probably note that this watch still has it's original bracelet! The dial is excellent - just a little dust to remove, otherwise it looks like new. 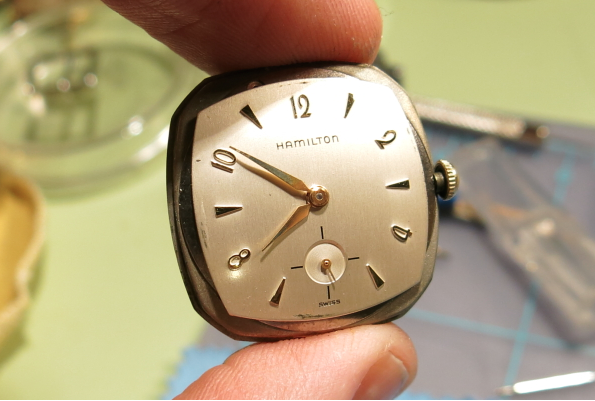 The Hamilton 673 was made by A Schild, a Swiss manufacturer and is identical to the AS 1200. 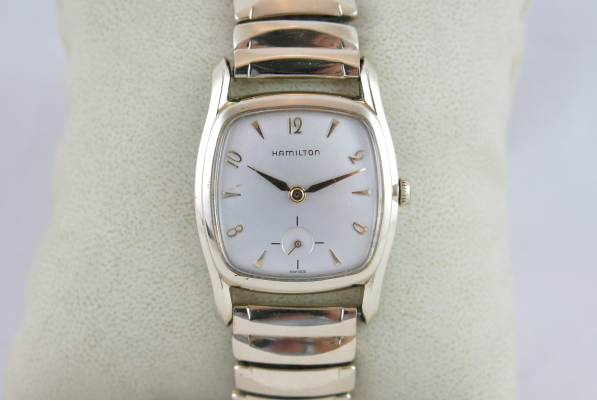 In fact, you can still buy a brand new AS 1200 today - it wouldn't say Hamilton on it though. I'll spare you the blow-by-blow details of how I took it apart, cleaned it and reassembled it. 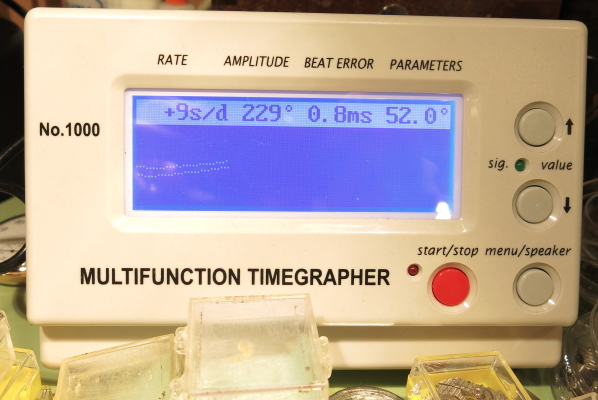 But suffice it to say that it turned out great and here it is running on my timer at about 9 seconds fast per day. Once it was all cleaned up I'd say it's a night and day difference. The glass crystal has a couple of scratches but otherwise this watch turned out fantastic. Hey. I have the Colby "B" model, and the stem just broke on me. Would you happen to know where I can find a good price on a replacement stem? Also if you would know anything about the Illinois movement it has and what stem I should get? I believe that model has a 12/0 size Illinois movement. It's an ETA 1220. Look on eBay for an ETA 1220 Stem and you can find a replacement. Thank you. I don't think anyone could have a Hamilton collection without this site. And now, this watch has so much more meaning than I ever thought possible...Thanks Dan. Dan, great job on the overhaul. I also have a Colby that is in need of a crystal replacement. I can’t for the life of me find a part number for a new old stock crystal. Any suggestions? The only thing I can come up with is the Colby B which is obviously not the right size.